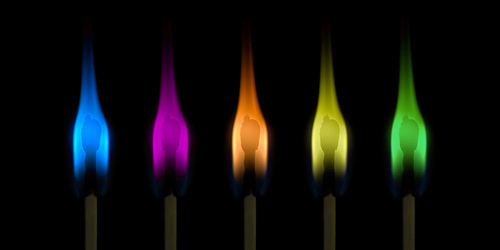 It is a simple, everyday object with a long and science-y history…the match. Today, we may strike a match to light a birthday candle or bonfire or a charcoal grill or a celebratory cigar, but for our ancestors, the ability to consistently start a fire meant survival. They relied on fire for heat, cooking, and light. Starting a fire was a necessity. The simple little match revolutionized fire starting by arranging flammable chemicals on the tip of a wooden or cardboard stick that would combust with friction. Simple, yet complex. We might have a picture in our minds of early man struggling to start fires using only flint to generate a spark, but in actuality, matches have been in existence for a really long time. There is textual evidence of this in books dating as far back as the thirteenth century. We do know that advances in our understanding of chemistry meant that, by the seventeenth century, people used matches made of paper that had been soaked in phosphorus then dried. It wasn’t until two hundred years later that we see the first matches that ignited via friction. John Walker, a chemist from England, invented a match that used a mixture of potassium chlorate, antimony sulfide, gum and starch in 1826. In Walker’s matches, the chemical mixture was affixed to a stick or paper and dried. The chemicals would burst into flames when the match was dragged across a rough surface, such as sandpaper. The theory behind Walker’s chemical reaction was sound, but the execution was not. The matches were unreliable at best. Just a few years later, chemist Charles Sauria from France piggybacked on Walker’s matches, but replaced the antimony sulfate with white phosphorus. The white phosphorus gave a more reliable flame, but at a price. When Sauria developed his matches, he was unaware of the toxicity of white phosphorus. It soon became apparent that prolonged exposure to white phosphorus causes a condition called phosphorus necrosis of the jaw, or “phossy jaw”, with symptoms that include toothaches, gum swelling, jaw pain, and brain damage. A treatment for “phossy jaw” was removing the jawbone, which greatly decreased the patient’s quality of life. As cases of “phossy jaw” leapt, white phosphorus was finally banned in 1906. This meant Sauria’s matches would need an alternative source of combustion. Fortunately, chemists had been working for years to find a suitable replacement to white phosphorus. Back in 1835, a chemist named Anton Schrotter von Kristelli learned that if white phosphorus was heated, or even exposed to sunlight, it morphs into a less toxic form of the element that was called red phosphorus. Chemically speaking, the red phosphorus was a cross between white phosphorus and an element called violet phosphorus. Dubbed safety matches, this version of the match co-existed with the white phosphorus matches until the 1906 ban. Match science continued to improve upon the fire starter. The safety matches of today have done a bit of a flip flop. The red phosphorus is now found on the side of the match box, on the striking surface, instead of the match head. 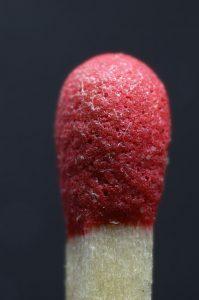 Replacing the red phosphorus on the match head is potassium chlorate, which serves as an oxidizing agent, which has been mixes with textured, abrasive substances to enhance the friction, plus a few other things that will help sustain the flame. Dragging this match head across the red phosphorus striking surface starts a chemical chain reaction that results in a flame. The friction caused a tiny bit of the red phosphorus to become white phosphorus, which creates a heat. The heat combines with the potassium chlorate on the match head and the oxygen in the air to combust. The match stick itself has been soaked in paraffin and ammonium phosphate. The paraffin is a fuel for the flame that helps sustain the flame. The ammonium phosphate snuffs out the afterglow when the flame dies out. 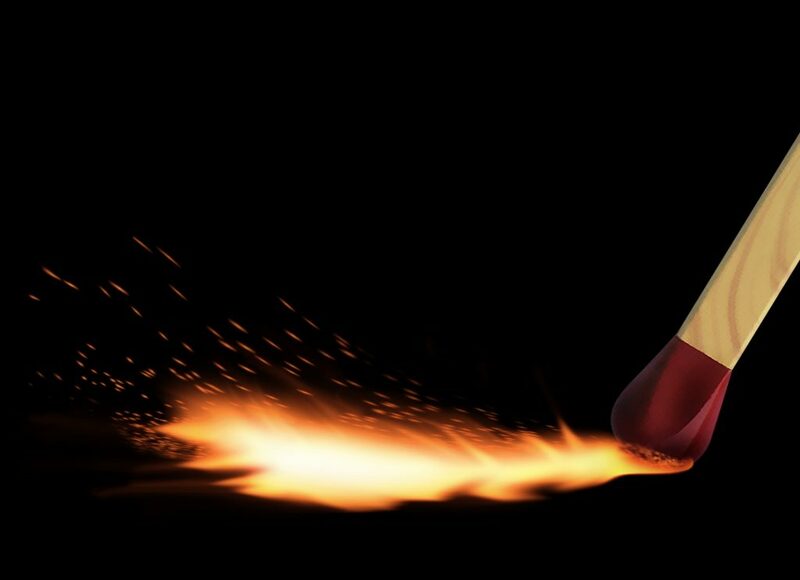 The “strike anywhere” matches – the ones that ignite if you strike them on any rough surface – work a bit differently. The red phosphorus, which was moved to the striking surface in the safety matches, remains in the match head in the “strike anywhere” matches. It is in the form of a compound known as phosphorus sesquisulfide, or P4S3. This inorganic compound was first produced in 1898 by Henri Sevene and Emile David Cahen, two chemists who were working to solve the issue of manufacturing reliable matches sans the dangerous white phosphorus. Although the chemicals used may be slightly different, the concept is still the same. The friction and oxygen start a chain reaction with the chemicals that, in turn, sparks a flame. Ironically, once chemists found the right combination of chemicals and perfected the match making process, the need for reliable matches began to decrease. Electricity, furnaces, and lighters all made life easier and less reliant on our fire starting ability. Despite this, we still use matches and still wonder at the brilliant burst of flame that erupts when a match is struck. “The Chemistry of Matches.” Compound Interest. 29 May 2016, Web. 2 Jan. 2018. “How Matches Work.” Discovery: Mythbusters. 7 Oct. 2014. Web. 2 Jan. 2018. “Match Head Reaction,” University of Washington Department of Chemistry. Web. 2 Jan. 2018.